If you plan to participate in OSU-Tulsa's Graduation Ceremony, please RSVP to ensure your name is included in the graduation program. Family and friends are welcome – no tickets or reservations necessary. Parking is free and available in lots surrounding Expo Square. If you or a guest will need special assistance because of a disability, contact Student Disability Services at osutdisa@okstate.edu or 918-594-8354 to make arrangements. The OSU-Tulsa Graduation Ceremony includes a ceremonial hooding for master’s and doctoral students. Graduate students should speak with their faculty advisor to secure hooding arrangements. Photos of graduates by Ervin Photography can be purchased at ervinevents.com. Order your cap and gown, personalized announcements, diploma frame and more through OSU's University Store at shopokstate.com. 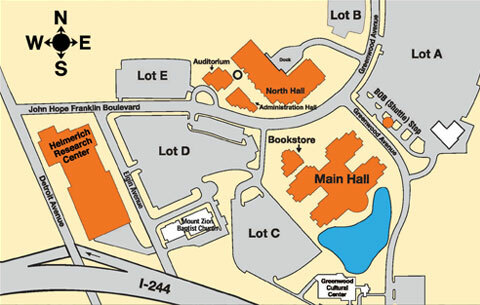 Choose free delivery to OSU-Tulsa and pick up at the Information Center in North Hall. Congratulations! OSU-Tulsa does not hold a fall graduation ceremony. If you are graduating in December, you can participate in OSU Stillwater's commencement exercises or walk in OSU-Tulsa's spring graduation ceremony held in May. Watch the OSU-Tulsa Graduation Ceremony live on OStateTV. OSU-Tulsa holds one graduation ceremony in the spring for spring, summer and fall graduates. OSU-Tulsa students may also participate in OSU Stillwater's spring or fall commencement exercises. For information about Stillwater's commencement exercises, visit the OSU Stillwater commencement website. For additional information about OSU-Tulsa’s Graduation Ceremony, call 918-594-8252 or email.